Custom designed Hot Rod Sled Shop precision machined and hardened billet steel ramps for more tuning options for the Tra primary clutch. We have designed these profiles to better suit the needs of tuners and customers and fill the void of suitable ramps from the oem selection. Ramps are sold in sets of 3. HRSS1 Ramp- This ramp we describe as a 414/441 combo although not the same as either. It is lower at engagement and initial start with less load than a oem 414, and tapers close to a 441 profile which loads the motor much more than a 414. The HRSS1 ramps also downshift incredibly well. Installed with our clutch kit on the 800 etecs, they achieve an engine braking effect down to 3500 rpms which is great for mountain riders descending steep slopes. This ramp is working great in big bore 860-872 Xp carbed and 800 etec sleds as well. Some extreme mountain customers have found it the absolutely best ramps with the most track speed and useable power applied to the track with 800 etec and big bores so much so the comment was they had to tighten the track and adjust the suspension. With 130 start rate springs engagement is around 3400-3500, 160 start rate springs 3800-3900. Please see the reference/comparison pics. The Hot Rod Sled Shop Inc. HRSS2 custom ramp is a new ramp we've developed that fills another void in oem ramp design. It is designed with a lower engagement notch and lower starting height for reduced initial rpm while still loading the motor and not building rpm too quickly. It has a less aggressive start than our HRSS1 or 414 ramp. It allows the use of primary springs of 160lbs.- 200 lbs. start force or greater without the aggressive grab and rpm. This helps prevent track spin, reduces belt slip , and of course belt and sheave heat. We also made the tip profile approximately .020" taller than the HRSS1 ramp. 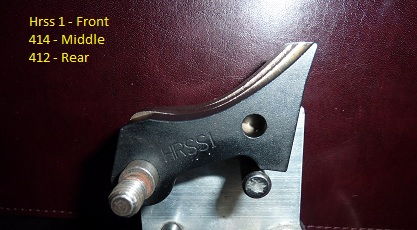 This places the tip profile right between a stock 414 and the HRSS1 ramp. the HRSS2 ramp also works really well with oversize rollers by reducing the "buzzy" feel of let's say a 414 for comparison at mid rpm (which really is increased rpm at mid throttle positions of 5000-6800 rpm). The taller tip profile helps maintain full shift rpm with the additional tip weight that oversize rollers create. We have tested these extensively with stock to 2mm oversize rollers with great success. 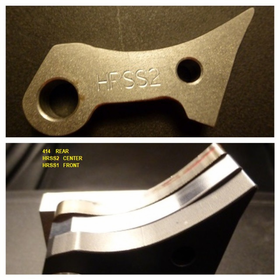 Check out the comparison pics with 414 back, HRSS2 center and HRSS1 front. Please call for setup information or tech questions as we are glad to help. This ramp for the Ski-doo Tra-2 clutches was designed for improved and prostock 700,800, & 1000 triple cylinder race application. This ramp design combines a ski-doo PX and 280 style ramp for a hard launch like a notched 280 for a tremendous holeshot yet loads the motor much harder from half shift to full shift. In the comparison pics you can see the lower belly and transition to tip than the 280 ramp. The tip profile is .015" taller than a PX. This ramp when tuned properly makes more mph than a 280 ramp setup. Track dyno testing at Pro-line as well as in field testing on grass and ice is showing good track horsepower gains over proven older setups. We have helix combos that work really well for many applications with these ramps. 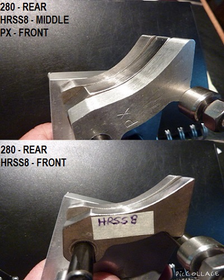 Customer feedback and testing suggests this blend of 280/PX style ramp is the ultimate big hp triple ramp set. Ramps are sold as a set of 3.